“Walking through this changing season, sorrow spreads its wings. We can’t keep a hold on time, just receive what it will bring” – Tim Wheeler. We have travel milestones, we have things we tick off, countries we ridiculously count, zeniths, low points and it all tides along into one lifelong journey, some eejits like me even see the need to document our journey every day. Memories cannot be replaced and this is one I won’t forget. 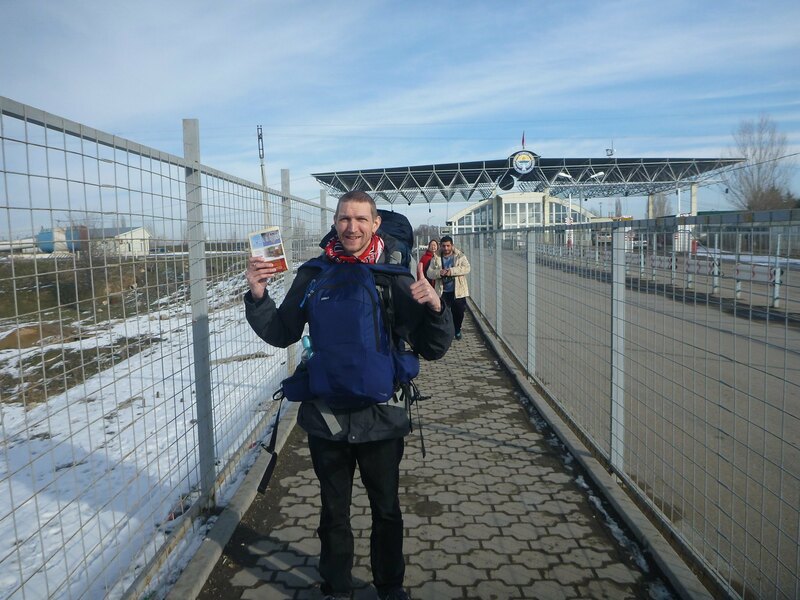 Arrival in Bishkek from Almaty in December 2015 promised nothing more than the usual backpacking stint for me – I would be in Bishkek for 2/3 days and then I’d move on to Osh, maybe to Dushanbe and I’d be on my merry way. For sure, I rarely linger. But somehow, things changed. After walking through Ala Too Square in Bishkek in my first 24 hours here, I knew I was staying. The magnetism of the city bore down on my metallic rucksack and begged me to stay and I’ll never know what that was. But here I am, April 2016, still in Bishkek, five months down the line, slowly in love with this city which has a heartbeat like no other central asian hub. Maybe it’s the progressive lifestyle, maybe it’s those remaining Soviet structures which add glamour and give a historic value. Maybe it’s the Kyrgyz people, so welcoming, so charming. Maybe it’s the cool people I met since arriving here. Maybe, maybe it’s just me – I’m a culture struck Northern Irishman. I never wanted to be anything else. The truth is, you never really know. “Maybe maybe it’s the clothes we wear, the tastless bracelets and the dye in our hair” – Brett Anderson. 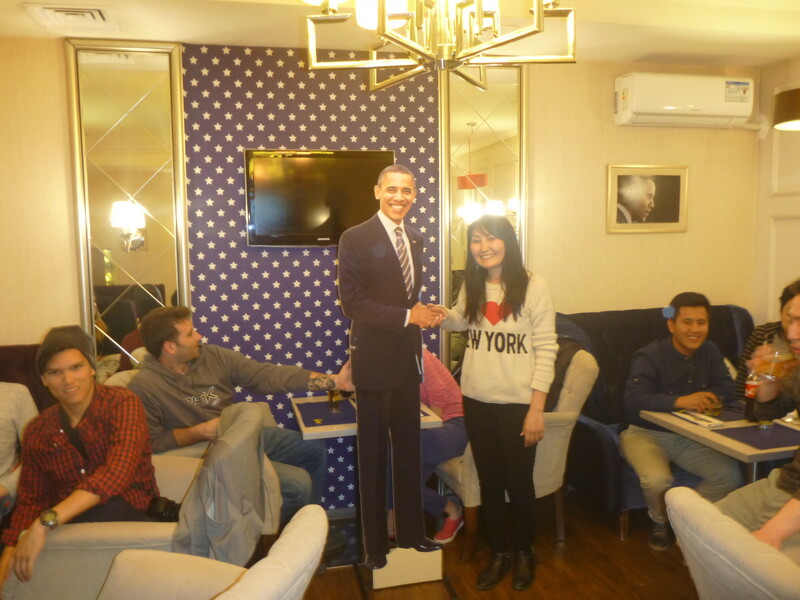 In my first month in Bishkek, I was sourcing visas, working on my travel blogging, testing out the best Wi-Fi cafes in the city and drinking by night in a range of bars. Slowly, it became my base and my home. 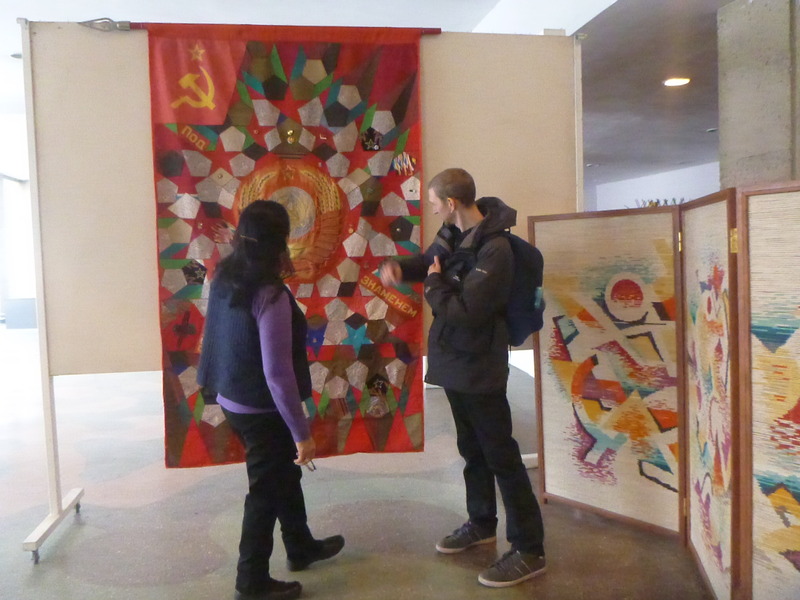 A home which visits to Tajikistan, Afghanistan, Uzbekistan and Kazakhstan couldn’t shift. 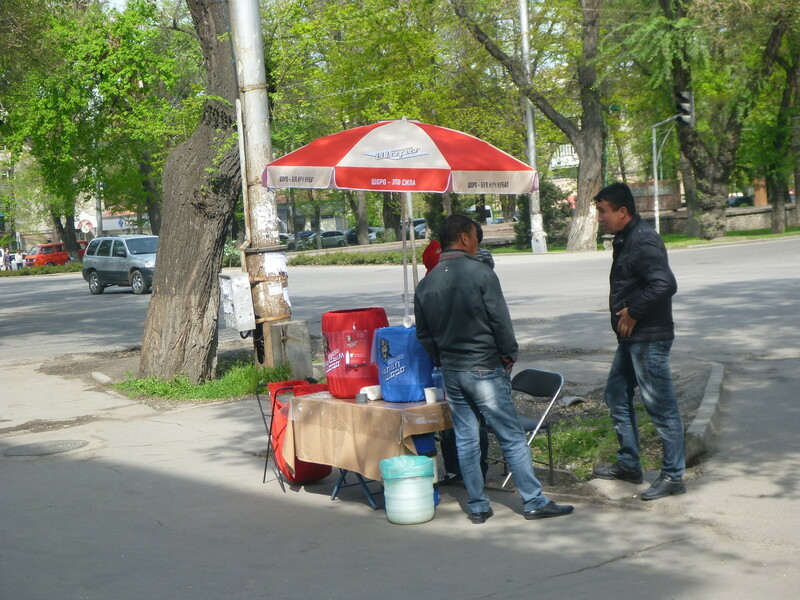 Bishkek had won me over and I felt I needed to give something back to the city. A quick online check revealed that there were no organised pub crawls, there was no Facebook group for a Bishkek pub crawl. 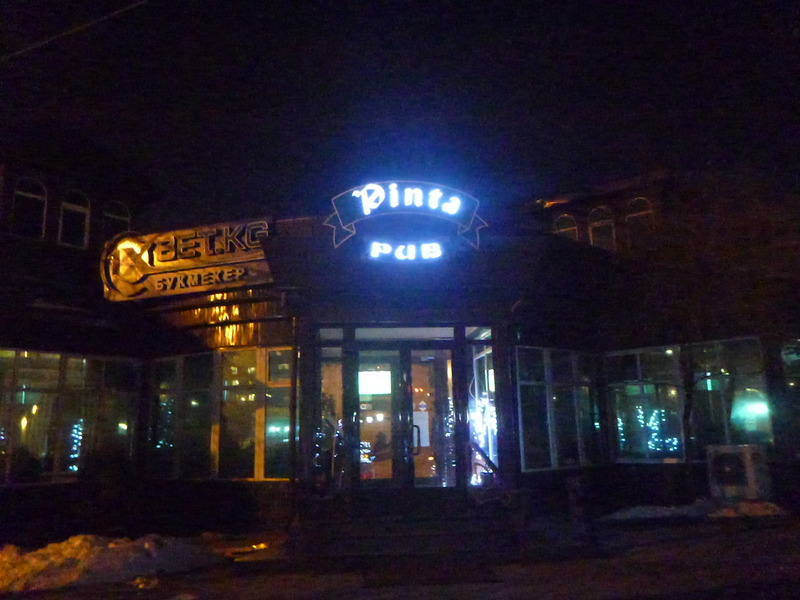 Now I had contacts through my travel work and the hostel lifestyle, so Aigul from Apple Hostel Bishkek and I got to work to plan the city’s first ever organised pub crawl. Everything came with a flourish and with a relative nonchalance. 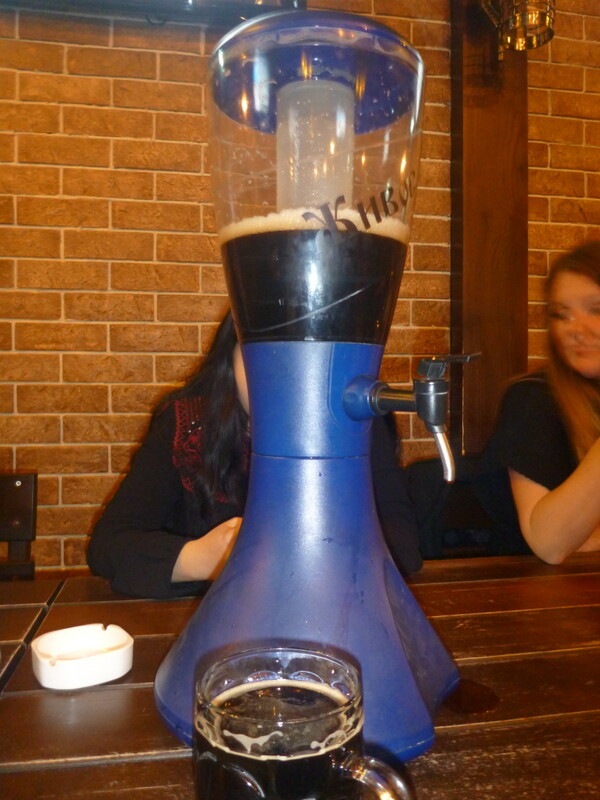 We contacted pubs seeing if it was possible to get group discounts, huge pitchers of beer, some discount entry fee for those that charged and we worked out the logistics. Bishkek is not renowned like London, Buenos Aires, Sydney or Berlin as a party zone. 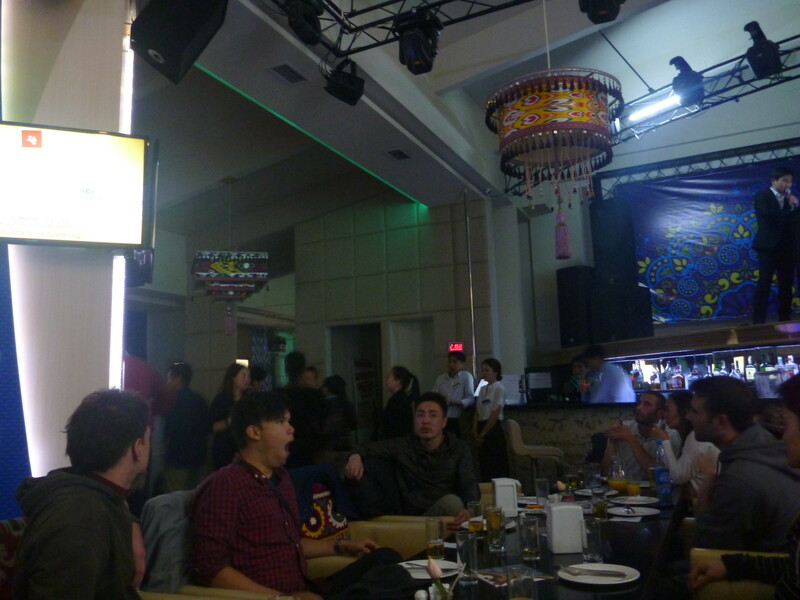 But one thing – Kyrgyz and Russian people live, drink and party here in contemporary harmony. It’s a joy actually. As R.E.M. once professed “shiny happy people holding hands”. 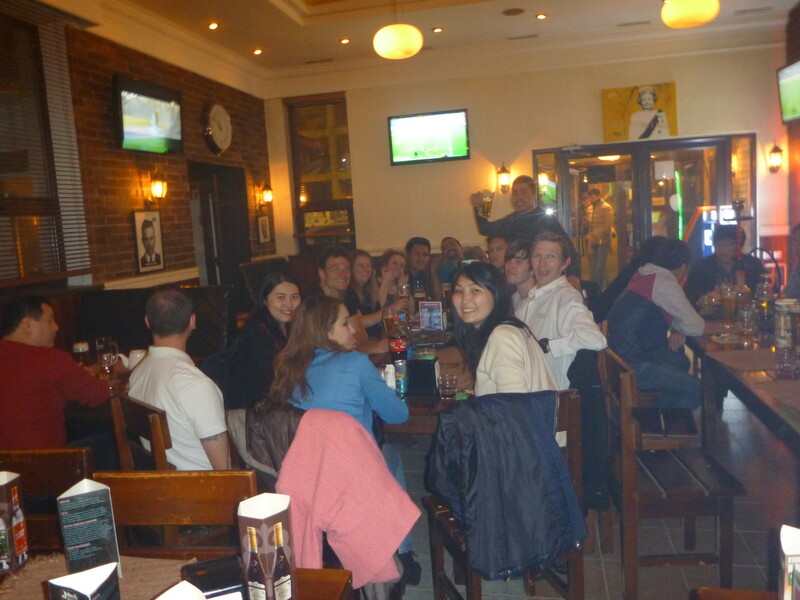 Put all this together, and the time was right to launch the first ever Bishkek Pub Crawl. We got an advert typed up and just hoped a few people would turn up! A bit of Facebook promotion and word of mouth to my hostel dorm buddies and long term backpackers and we had the time and date set – 7pm at Daamduu Restaurant near the west bus station on Saturday 9th April 2016. 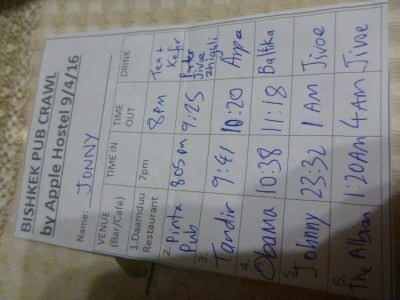 Here’s how the evening went and the drama unfolded. 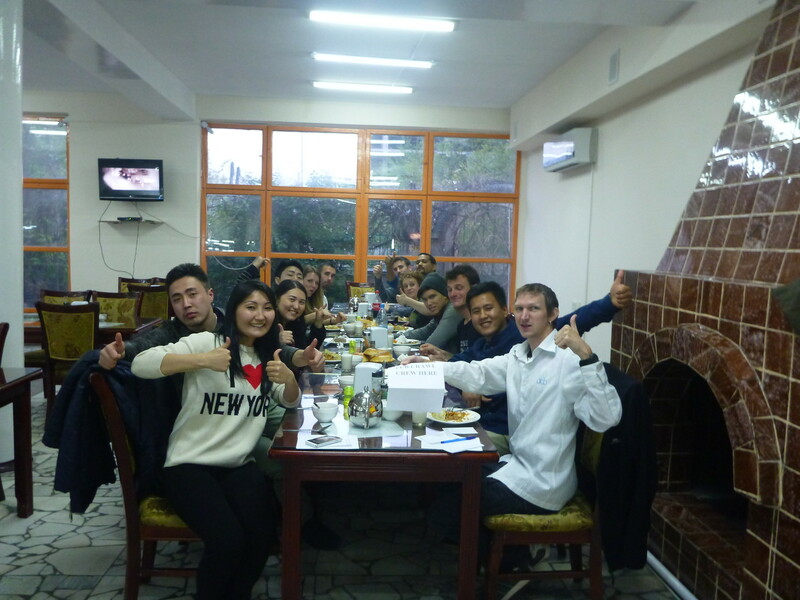 We decided to start off low key with a Kyrgyz meal, Kyrgyz tea and a choice of either Ayran or Kefir. 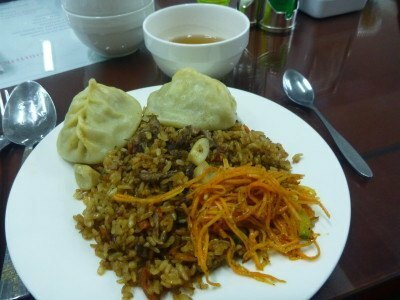 Daamduu Restaurant has also been my local eateries here in Bishkek. 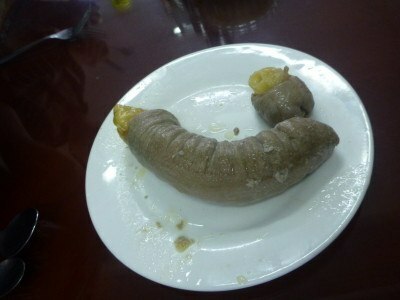 The food is good, consistent, cheap and the place is open from 7am until midnight so I can eat when I want. It’s next door to Apple Hostel Bishkek and also to the western bus station. 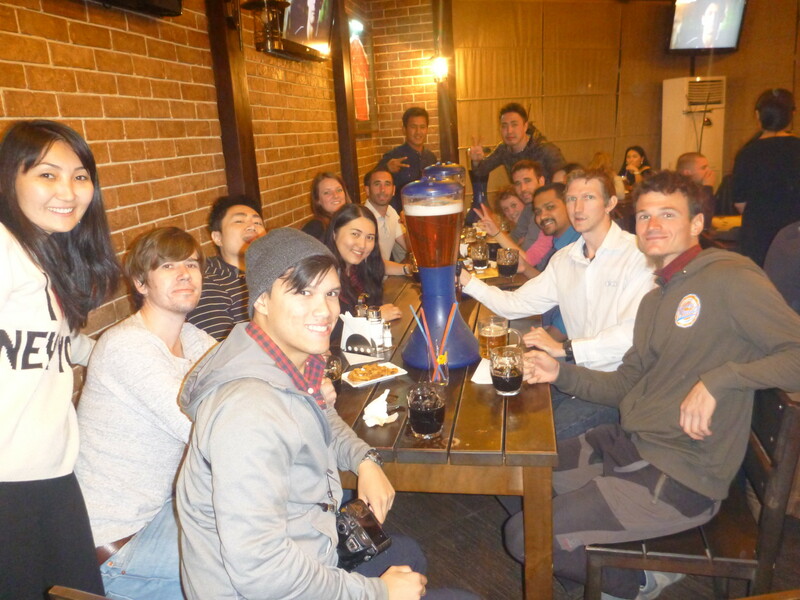 First arrivals to the pub crawl were Omor, Beksultan and Meeram, a local Kyrgyz lady and two local Kyrgyz guys who we had also met before at the pub quiz in Burger House. 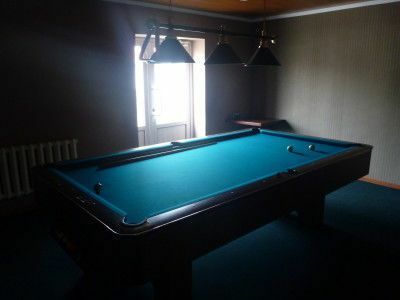 We are joined by Lukas, Ricky and Ryan from the hostel soon. We eat pilov with manty and bread except for Ricky who has his own horse intestine meal. We have local tea and a choice of Kefir or Ayran. The crowd increases with Ben, Adam, Narella, Joe, Vicki, Brett, Aigul, and Jonny (myself). We count 9 different nationalities on the pub crawl (Kyrgyz, Swiss, Norwegian, Thai, US, Australian, Canadian, South African, Northern Irish). 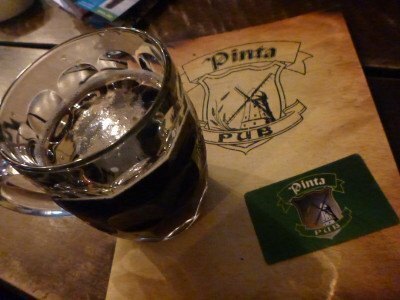 Just before 8pm, I announce that there are two taxis booked to take us to the first alcohol venue on the crawl – Pinta Pub. We get a group photo and off we go! It’s still daylight, but fading now! Of all the pubs in Bishkek, you could argue that Pinta Pub has the best selection of local beers and we get a total of four massive pitchers to share, with three different types of beer included. There is also live football on here, Swansea City beat Chelsea 1-0 but we are caught in the moment and drinking so we don’t really watch it. 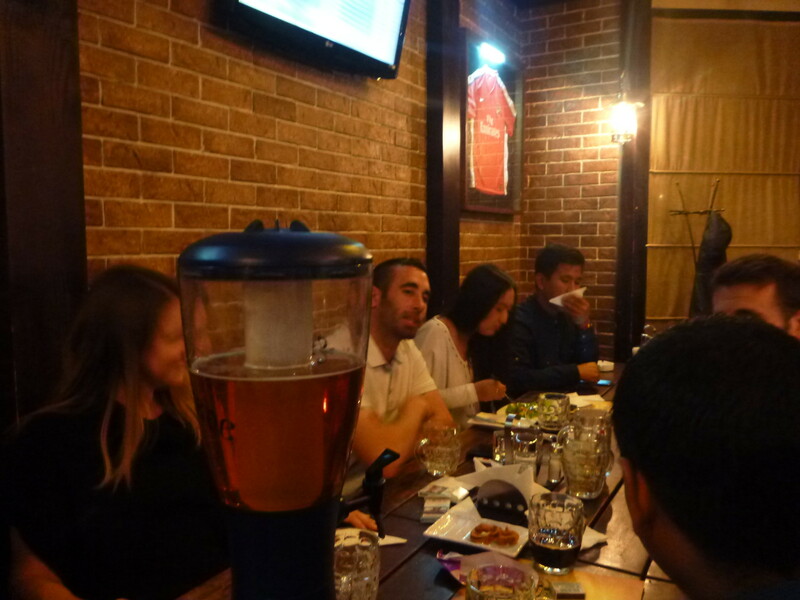 So we try three different beers – the first is the dark Porter (local Porter), then we also try the Jivoe (local lager) and the Zhiguli (local unfiltered lager). Everyone’s getting on well and we are joined by tow more ladies on the crawl, who skipped the food part. 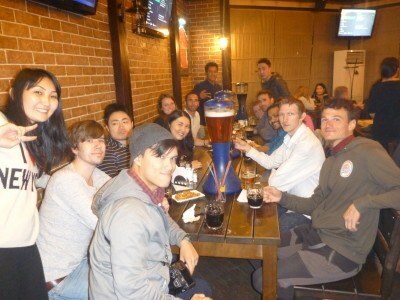 Aigul encourages a drinking game to speed things up with a “down in one” competition, with Joe and Brett winning. One of the things we wanted to do on the pub crawl was make sure the venues are varied. 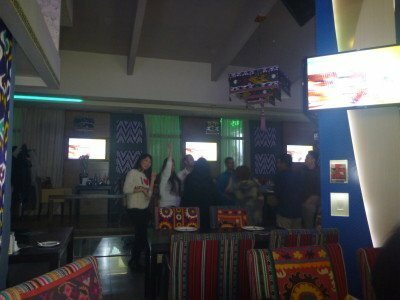 There were some time constraints though – the live music at Tandir Restaurant was due to run from 6 – 10 pm only so we left Pinta at 9.20 pm to make sure we caught the singer. We order generic beers on tap here, initially thought it was Arpa, but we find out later it was Zatecky Gus, a Czech beer brewed in Russia. 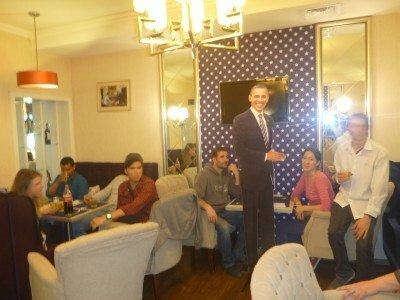 Some of us get up to dance for a bit and we all finish our beers and head round the corner to meet the U.S. President. At Obama’s we have the Baltika Russian Beer and get a glass each. 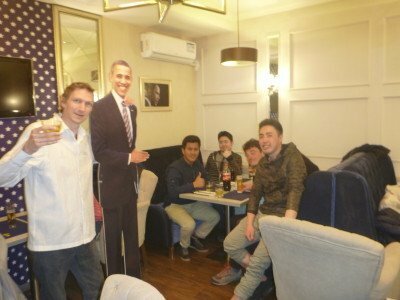 We take it in turns to get silly photos with Barack Obama himself, the novelty value of this bar the reason for its inclusion on the pub crawl. 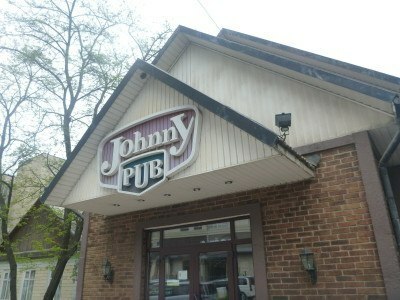 On the same street as Obama’s Bar and Grill, we head down to Johnny Pub. This is a kind of local sports venue, with some extra quirks like the shisha and live sport on TV. We all get a Jivoe beer in here and chat turns to politics! Most of us opt for shisha to smoke and we get two for the entire table and share them. We add a final pub to the list quite spontaneously. 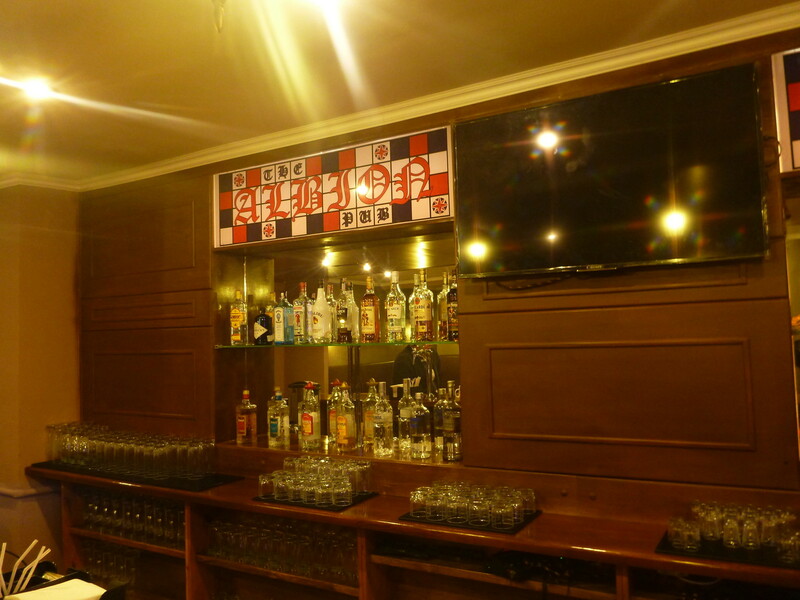 The Albion is a newly opened British Pub in town and offers live UK football, a pool table and a mixture of foreigners (ex-patriots) and locals. 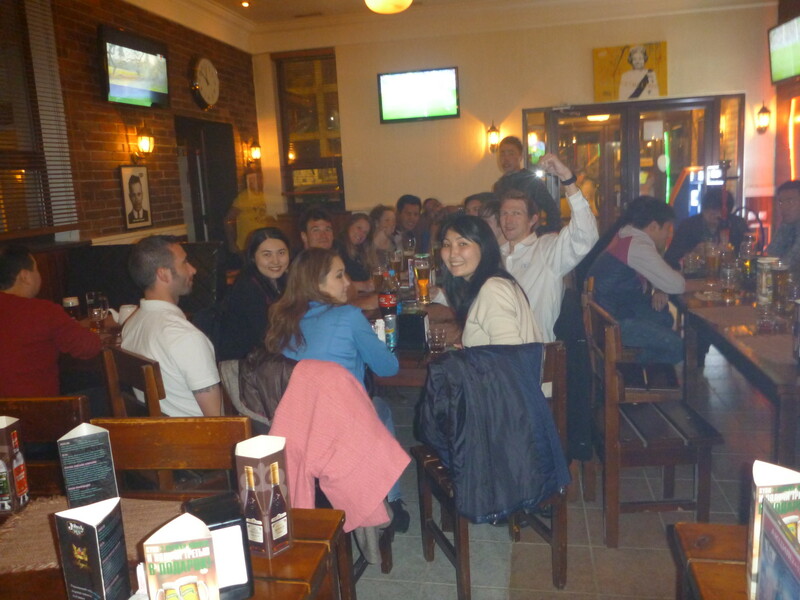 Some of the crowd head home before the Albion, but everyone agrees it has been a fabulous night on the first ever Bishkek Pub Crawl! In the Albion, I met Bishkek’s most famous Northern Irish ex-patriot, Norman and we watch golf and football together to the early hours before myself and my dorm buddies Ricky and Lukas head back to the hostel. 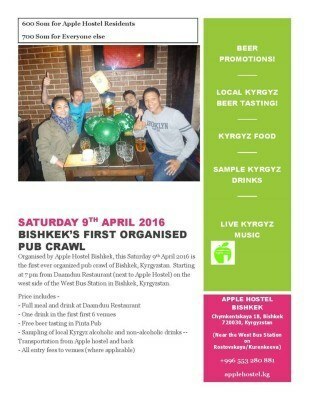 There will be more to come, so come and join the fun on the Bishkek Pub Crawl. I was happy to have helped kick start it and hope it becomes successful and continues in the same vein. 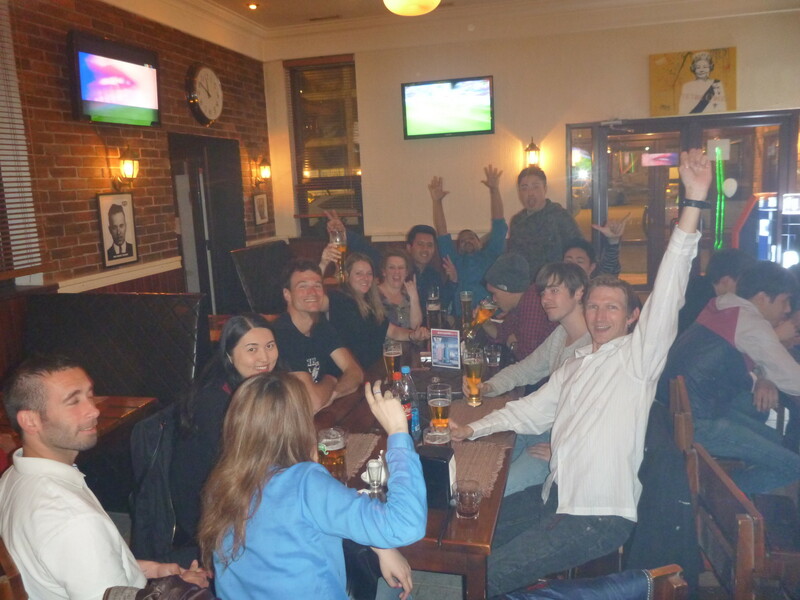 Thanks to everyone who turned up and made history, it was great fun and a great night. 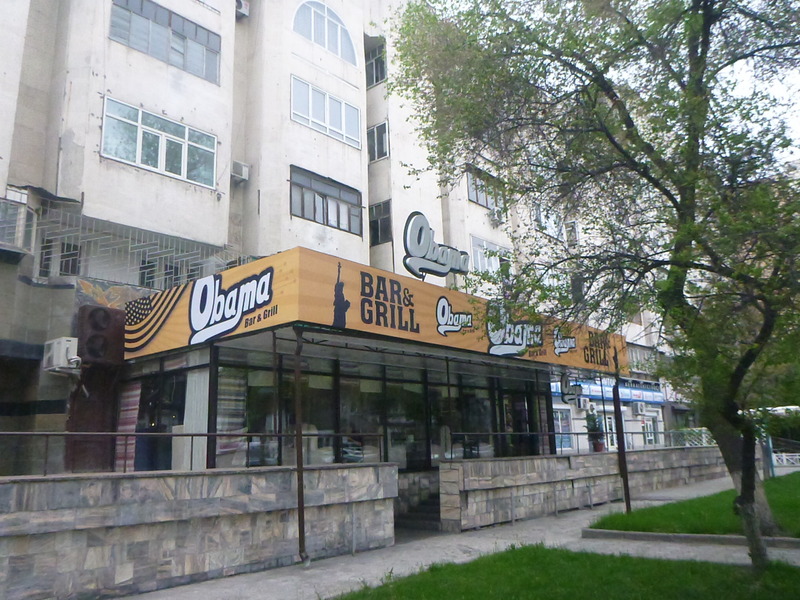 As I prepare to wave goodbye to mighty Bishkek, it’s glaringly obvious that I’ll shed a tear on departure from this town. It’s one of a kind. Bishkek, don’t ever change. 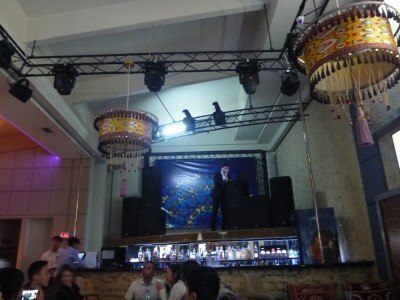 Nice of you to give back to Bishkek like that! Hope your legacy remains long after you have gone. Slainte! Good luck with the second pub crawl! Out of curiosity, what are you are other top 3 favourite cities then?